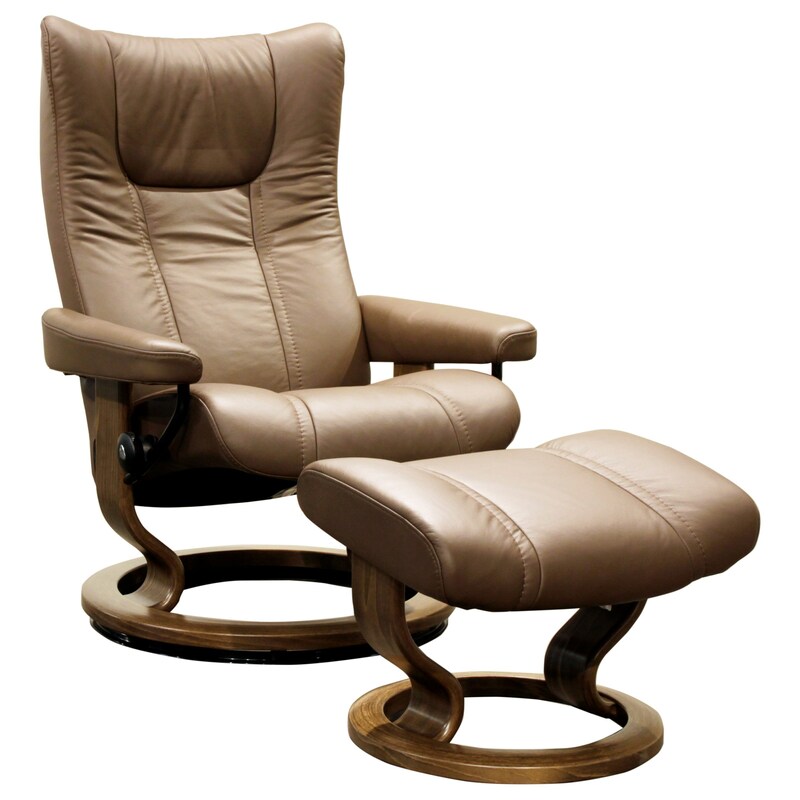 The Stressless Wing recliner and ottoman set features a patented auto-glide function that takes cues from your body weight and the slightest body movement to ensure that you are receiving perfect support and comfort at all times. A double stem hard floor protection base supplies maximum support and allows you to swivel a full 360 degrees with the mere push of a foot. The lower back support adjusts in parallel with the headrest, so you can enjoy perfect support, whether you are sitting in an upright or reclining position. The Wing Medium Stressless Chair & Ottoman by Stressless at HomeWorld Furniture in the Hawaii, Oahu, Hilo, Kona, Maui area. Product availability may vary. Contact us for the most current availability on this product. Fabric Content Four types of leather to choose from, each in a full range of colors. The leather is vibrant and beautiful upholstery material. The play of color in leather and its natural markings make each piece of furniture unique. Arm Modern arm design for a clean contemporary look. Seat Back Adjustable headrest and a reclining seat that follow your body's slightest movements to provide perfect support and comfort. Seat Simply adjust the Stressless® Glide wheels to the setting of your desire. You can automatically shift to any seating position simply by using your body weight. Footrest Operation Ottoman has built-in glide function that moves with your legs, for extra comfort.